Go for the ultimate 'wow' factor with this exotic orchid corsage set in a rich shade of cerise. Both the hair decoration and wrist adornment are carefully made using the freshest flowers to create a coordinated look to gives an extra touch of elegance to that special outfit. 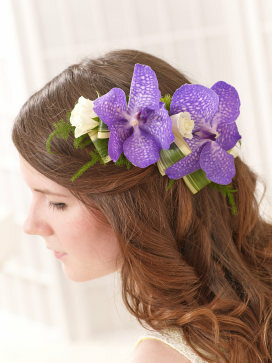 Vanda are one of the most eye-catching varieties of orchid and this hair comb featuring two striking heads with creamy white spray roses is exquisite. It is a stunning way to complete your outfit and is certain to ensure that you stand out from the crowd. 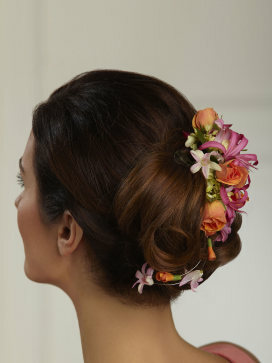 We've chosen warm shades of dusky pink, cerise and burnt orange to create this sensational fresh floral hair decoration. The rich collage of tones will compliment fair of darker hair and adds an impressive and very beautiful finishing touch that can be worn with pride. From ruby red to rich purple, warm coral and pale gold, this headband is a distinctive design that really completes that special outfit. The vibrant shades and touch of gold sparkle combine perfectly for a dramatic and very beautiful effect. 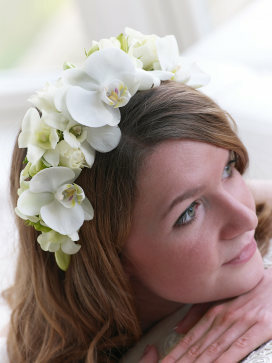 This elegant floral headband will make a spectacular accessory to enhance the perfect dress. A beautiful design with exotic fresh white orchids and pretty cream roses, this feels really special and is certain to look amazing in the photographs. An irresistible adornment of radiant colour that is also rich in detail. 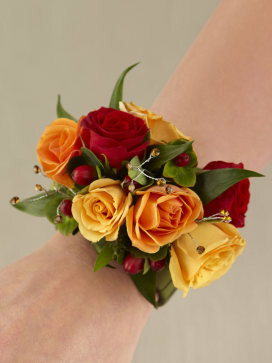 The natural beauty of these classic roses will enhance any dress perfectly. 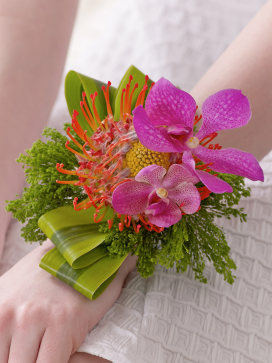 This exotic wrist corsage is a dazzling display of gorgeous tropical colour. The exquisite hot pink orchids partner perfectly with the distinctive orange and yellow flowers to create an unusual and eye-catching finishing touch for that special outfit. 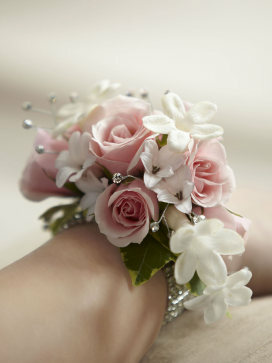 We've gone for a look that's classically feminine and graceful with this exquisite wrist corsage. Fresh roses in softest pink, dainty white stephanotis and delicate hyacinth flowers mingle with sparkling rhinestones to create a very beautiful adornment. 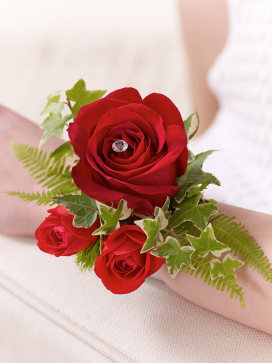 This impressive wrist corsage has the timeless appeal and romance associated with the iconic red rose. 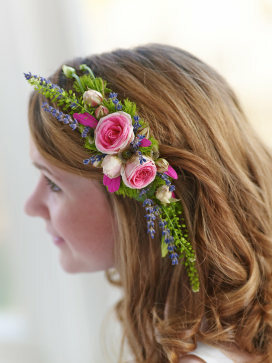 We've added pretty foliage and a touch of sparkle to create a beautiful adornment that can be worn with pride. 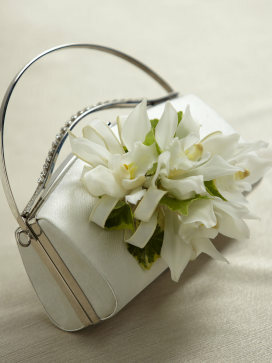 Adding a stylish corsage of fresh flowers to a handbag is a chic and original way to make an outfit even more special. This carefully designed handbag corsage showcases four luscious white orchids, enhanced by the deep green shades of fresh ivy.